Ralph Ellis' latest book is two books in one! The first book is CLEOPATRA TO CHRIST -- The Bible says that the infant Jesus was visited by the Magi of the east, and that he was educated in Egypt. Jesus seemed to be of royal blood, and hence was crowned King of the Jews. The inference from these sparse facts is that Jesus was of both Egyptian and Persian royal blood, but that he was exiled to Judaea in about 4 AD. This may seem like an impossible family history to reconstruct but, strange as it may seem, there was a royal family in the early first century AD that fits all of the requirements to produce this scion. Although this family's history has been known about for hundreds of years, theologians and historians have failed make the obvious deductions. The second book is SCOTA: EGYPTIAN QUEEN OF THE SCOTS -- Some six hundred years ago, Walter Bower set out to record the known history of the Irish and Scottish people. Drawing on records from the first millennium AD, the astounding account he wrote maintained that the Irish and Scottish people were descended from Queen Scota, who was an Egyptian princess. It is from Scota and her husband Gaythelos that the names for the Scottish and Gaelic people were derived. Needless to say, it has been assumed that this account is mythological; however, Ralph has amassed sufficient information to demonstrate that it is true history, and that the Irish and Scots people were descended from a daughter of Pharaoh Akhenaton. Includes 12-page color section. 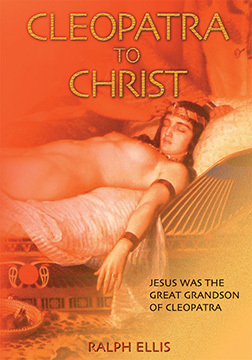 CLEOPATRA TO CHRIST, Scota: Egyptian Queen of the Scots, by Ralph Ellis. 420 pages. 6x9 Paperback with flaps. Illustrated, bibliography, and index. Color photo section.